Properties in Pollença average 4.5 out of 5 stars. Property 2: The villa has a great garden with a long rectangular pool. Property 6: Conch cute apartment in Cala San Vincente! 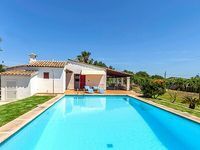 Property 18: Modern 4 bedroom villa with private swimming pool, a short walk from historic Pollensa Old Town. Property 28: Villa With Private Pool Just 800 Meter From Pollensa. Property 29: Modern apartment, cozy, sunny located a few meters from the beach. 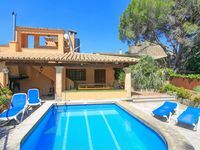 Property 30: CAN GUILLO - Villa for 8 people in Pollensa. Property 33: Beautiful and new countryside villa between Pollença and Puerto Pollença. SUPERB TOWN HOUSE in historic Pollensa town - wifi, air con, WALK EVERYWHERE! Property 50: SUPERB TOWN HOUSE in historic Pollensa town - wifi, air con, WALK EVERYWHERE!